By Oct 2016 there are four prides and a total of 45-50 lions in the Ndutu region (not including visiting groups and nomads). Half of them are cubs or sub-adults (<3 years old). The marshes of Ndutu are a wildlife refuge, and the core area of Big Marsh pride. Livestock is not permitted to enter this area, and the Big Marsh depend on wild prey, and often struggle for survival in the lean dry season. South of Lake Ndutu and lake Masek is the core areas for the Masek and Twin Hill prides. This area fills with people and herds of livestock during the dry season. We have deployed GPS collars on a few of these lions. Read more about lioness Nayomi here. From the collar data we gain insight to the shift in behaviour of the lions that we all assumed moved off during the dry season. They did not disappear. To the contrary, they were often closer than you imagined, securely tucked into dense vegetation during day-light hours. At night they nip out, often hunting or scavenging lost or dying livestock, occasionally bringing down a giraffe. They are generally better fed compared to their Big Marsh neighbours due to the easy (but dangerous!) access to livestock. 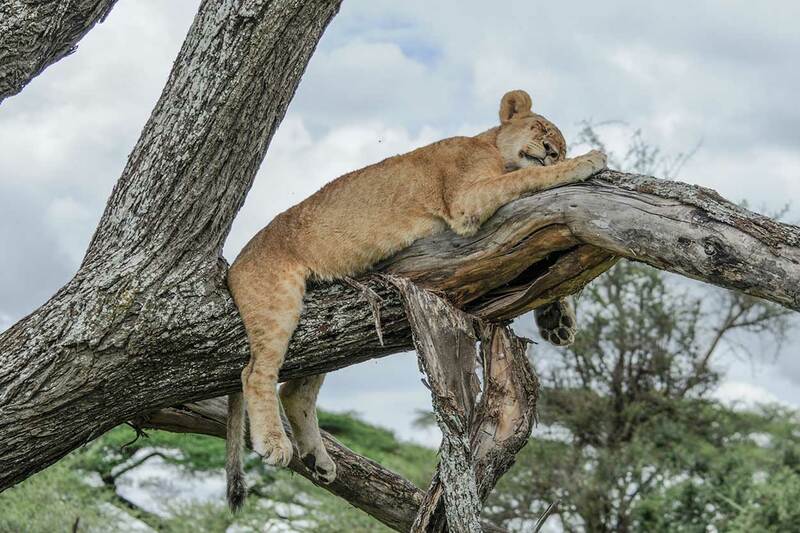 As rains return and the pastoralists move off with their herds, these lions resume more relaxed behaviours, become more active in daytime, and we often find them resting and playing out in the open. Nayomis niece up in a tree in Ndutu. Ndutu Area Population, by October 2016. Click to enlargen.